It has been pretty silent around here on this blog the last week. I have my (wonderful) in-laws here at the moment and we’ve been busy doing all sorts of things together. Lots of walks, trips to Milan, delicious meals together and board game playing. The kids are in heaven with the non-stop playmates (and chocolate givers). This past week-end the weather was rainy and miserable so we ended up spending the entire Sunday inside the house. 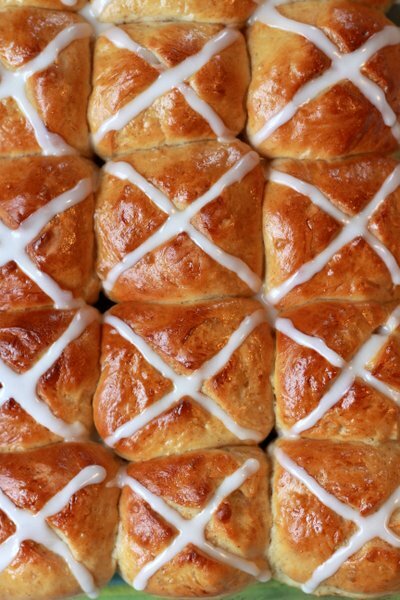 For vieruurtje (Dutch for afternoon-snack and literally translated as “little 4 o’clock”) I made the clan some good ol’ Easter Hot Cross Buns. This is a basic recipe and much simpler than the traditional recipes that seem to include a ton of steps. Usually I would also add some candied citrus peel or currents to the dough but unfortunately my kids would disown me for life and run out the door and never come back if they found such things in their buns. I took a basic white bread recipe and added some extra sugar and cinnamon (similar to the Cinnamon Swirl Bread from last week). 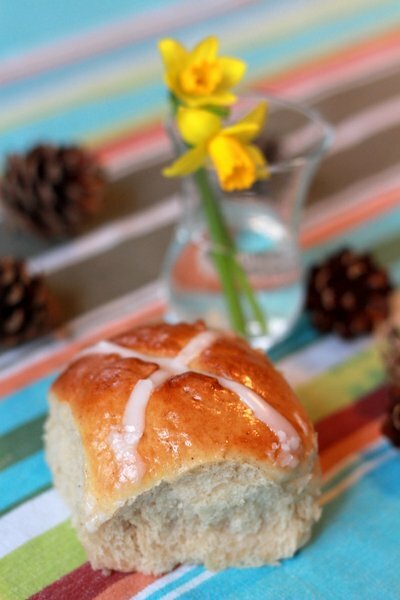 These buns come out really soft and spongy and actually keep fresh for a day or two. Before putting them in the oven I take a sharp knife and slash a cross on the tops. That way there is a perfect indentation for the ever important icing to settle into (after cooled). 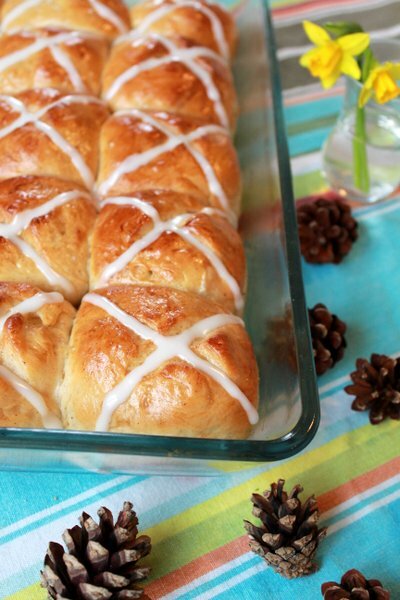 Nothing really gives me that Easter feeling more than a pan of fresh-out-of-the-oven Hot Cross Buns (and a sunny garden full of blooming flowers of course). Throw in some kids wearing pastel coloured spring dresses and straw hats and it’s absolutely perfect. 1. Gently heat milk and butter in microwave until butter is melted. 2.In large bowl (or bowl of mixer) add sugar, salt and cinnamon. Pour warm butter/milk mixture into bowl and stir. 3. In glass bowl mix warm water and yeast and stir until yeast has dissolved. Pour into bowl and mix well. 4. Add 2 1/2 cups of flour and turn onto floured surface (or use stand-up mixer with dough hook) and knead for about 5 minutes. Add flour as needed. 5. Put dough in a greased bowl (making sure to turn dough over so top is greased as well) and cover with plastic wrap. Let rise in warm place for about an hour (or until doubled in size). Now punch dough down and knead by hand for about 1-2 minutes. 6. Shape dough into rolls (of any size) and fit into pan (I used a glass rectangular pan). Cover with dish towel and let rise for approximately half an hour. 7. With very sharp knife cut a cross into the tops of buns (not too deep!). Brush with beaten egg. 8. Place in pre-heated 375 degree oven and bake for about `15-20 minutes (depending on size of buns). Take out when tops are golden brown. 9. When the buns have cooled mix up the powdered sugar and milk until the right consistency (not too runny nor thick) and pipe (or pour) into cross indentation. They really are so delicious too! I really wanna try them. Look so delicious! These look perfect. I had forgotten I need to make them this Friday. They are my favourite. Will have to try your recipe. Happy Easter! Happy Easter to you too Nicola. Hope spring has arrived up there in France.